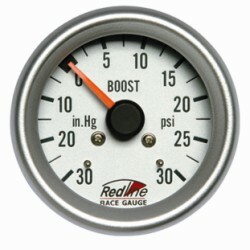 Redline Race Gauges are manufactured from the finest materials by a quality assured company to OEM standards. Backlit lighting with bright orange fluorescent pointer gives clear reading for night driving. Silver face, easy to read markings and attractive brushed silver bezel.